I am beginning to wonder if I need to rename this blog. Maybe I should name it The Harried Muffin Maker. That's how much I've been making (and posting) muffins lately! Muffins happen to be my husband's breakfast of choice, and so I tend to make them quite often. And it helps that muffins freeze really beautifully and so I sometimes make a double or even a triple batch of his favorite muffins and pop them in a freezer bag, and into the freezer they go! 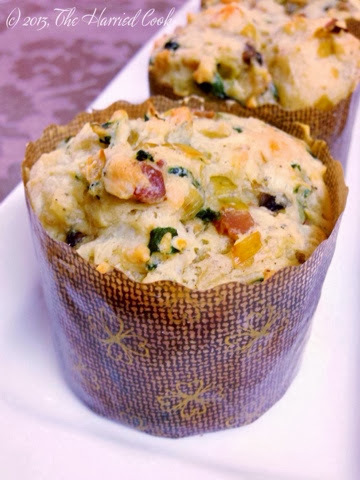 These particular muffins are amazingly good! They taste fabulous warm and fresh, and somehow taste even better the next day! And they're not too bad for you either! 1. In a frying pan, sauté the leeks and mushrooms together in the 2 tablespoons of butter until the leeks are soft and translucent. 2. Add the chopped spinach and the chopped mushrooms and sauté until the spinach is wilted and the mushrooms have softened - about 3-4 minutes. Season lightly - just a pinch of salt will do. Set aside to cool slightly. 3. Preheat the oven to 180C/350F. Line your muffin tray with paper liners or grease and flour them. 4. In a medium bowl, stir together the flour, salt, pepper, baking powder and baking soda. 5. In a small bowl or measuring jar, stir together the oil, yoghurt, egg and cheese. Whisk together lightly and combined. 6. Take the bowl with the flour mixture and make a well in the middle of these dry ingredients. Pour the oil mixture into this space and stir lightly till just combined. Don't overmix. 7. Add the slightly cooled bacon mixture and fold lightly to distribute evenly. Don't overmix. 8. Spoon the mixture into the muffin cups. Don't fill more than 2/3rd of the way. 9. Bake in the preheated oven until lightly golden on top and springy to the touch. 10. Serve warm. Refrigerate or freeze leftovers. 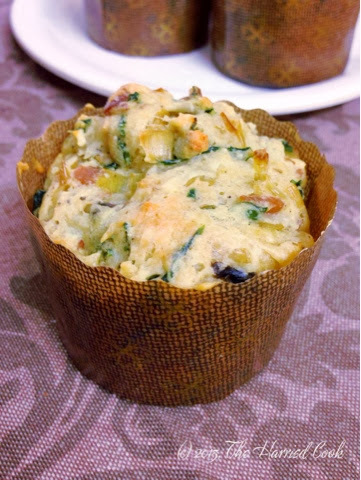 I made these muffins based on what I had in the fridge. I guess substitutions will work well - onion, garlic chives, ham etc. should all work great! I didn't follow a recipe and these turned out great (whew!) - so don't hesitate to experiment! The muffins should stay good in the fridge for a couple of days. 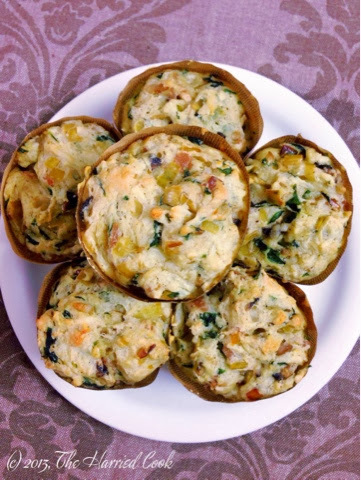 If you want to store them longer, pop the fresh muffins into a freezer bag and put them in the freezer. They should stay good for a couple of weeks. The flavors are really complementary to each other, and somehow the flavors really meld, and intensify overnight. So good! You really must try this recipe! Wish I had caught this earlier. I have all the ingredients for these delicious looking muffins. Yet, I baked banana muffins because it was clean-the-refrigerator day, and I had enough bananas to feed an entire banana republic. I love the fact we can eat this for breakfast ! Awww! You must try this recipe sometime though! It really is super yummy! <3 Thanks for stopping by! Absolutely... and for brunch, lunch, dinner or a snack :) haha... :) Thanks for stopping by!